All week, the chatter was about Johnny Damon's pedicure, Jason Varitek's back waxing, and Kevin Millar's pumpkin facial. Yesterday, all the action was on the field as the Red Sox brought their makeover maharishis, the crew of ''Queer Eye for the Straight Guy," to Fenway Park to sing the national anthem and throw out the opening pitch before a crowd of 35,000. Many cheered. But others shook their heads or looked on stoically. Isolated boos also resonated in the ballyard. 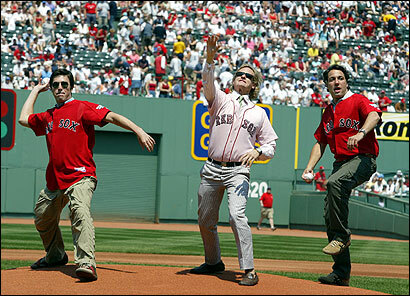 The arrival of the ''Queer Eye" crew, down one because of a scheduling conflict, was a milestone of sorts for Fenway, where one season ticket holder remarked that 15 years ago it would have been unthinkable for a gay man to run out to the mound in a pink shirt to throw out the opening pitch. And while the appearance of the ''Fab Five" had sparked criticism from some commentators and fans, for many yesterday the occasion was just another example of a changing culture, in which Ellen DeGeneres and the characters from ''Will & Grace" are household names, gay people can marry in Massachusetts, and ''Take Me Out," a play about a homosexual baseball player, is a Tony winner. ''The Red Sox embraced it," said Kevin Herschen, 26, who came to the game from Rhode Island with his father, Paul. ''I don't mind." The ''Queer Eye" season premiere, scheduled to air tomorrow on Bravo, will show all the openly gay cast members -- Jai Rodriguez, Carson Kressley, Ted Allen, Kyan Douglas, and Thom Filicia -- primping and grooming Damon, Varitek, Millar, Tim Wakefield, and Doug Mirabelli. Filmed in Fort Myers, Fla., during spring training, the makeovers helped raise money for charity. The players, in submitting to the spa treatments and wardrobe upgrades, raised $100,000 in donations and corporate sponsorships to rebuild a Florida Little League team's hurricane-damaged fields. In turn, the Red Sox invited the ''Queer Eye" team to Fenway to publicize the TV show, said Glenn Geffner, a Sox spokesman. The team got only a few complaints prior to the appearance, he said. ''People are trying to make so much more of this than what it is," Geffner said. ''Our guys had a great time doing the show. We had a great time seeing those guys again today. It is what it is." Others in the stands, however, felt differently. Carmen Carbone, 40, a copy machine technician, slumped in his seat and shook his head at the display. He said it exposed the team to unnecessary controversy -- and teasing. Last week, he said, Yankees fans razzed Red Sox fans relentlessly about the makeovers during a series in Yankee Stadium. ''To me it doesn't matter, but keep it to yourselves," Carbone, of Melrose, said after three ''Queer Eye" members lobbed the pitches to start the game. ''If I owned the Red Sox, I wouldn't have done it." His girlfriend, Karen Garofalo, nodded. ''I think all the other teams are laughing in our faces," said Garofalo, 41, a secretary from Revere. Many who brought children to yesterday's game said they had no problem with the presentation, which included a rendition of ''The Star Spangled Banner" by Rodriguez, the ''culture vulture" of ''Queer Eye." Pitching honors fell to Douglas, the ''grooming guru," Filicia, the ''design doctor," and Kressley, the ''fashion savant," who stood out in a rose-colored Red Sox jersey. Some parents paused to think what they would say if their child asked what ''Queer Eye" meant. Duane Booth, 40, of Wells, Maine, said his 8-year-old son has knowledge about the gay community, which he said has a particularly strong presence in neighboring Ogunquit. ''It's not something we talk to him about," he said. ''I don't really feel comfortable." If the boy were to ask him for a more specific definition of ''queer," Booth had a plan. ''Probably just ride over to the next town and show him," he said, laughing. Sean Carney of Dracut said he had no problems discussing the topic with his three children. One of them, 10-year-old Kerrin, easily identified the ''Queer Eye" crew as she stood in the stands by her father. ''They're gay," she said matter-of-factly. Kressley's appearance, however, left her befuddled. ''I thought it was a little weird," Kerrin said. ''Normally, guys don't come to a baseball game and throw the first pitch wearing pink." That was irrelevant to Red Sox fans who came to the game yesterday for one thing: to see their team beat the Los Angeles Angels of Anaheim 6-3. ''As long as they win," Paul Herschen, 50, said with a smile. ''As long as they win." Maria Cramer can be reached at mcramer@globe.com. Maria Sacchetti can be reached at msacchetti@globe.com.